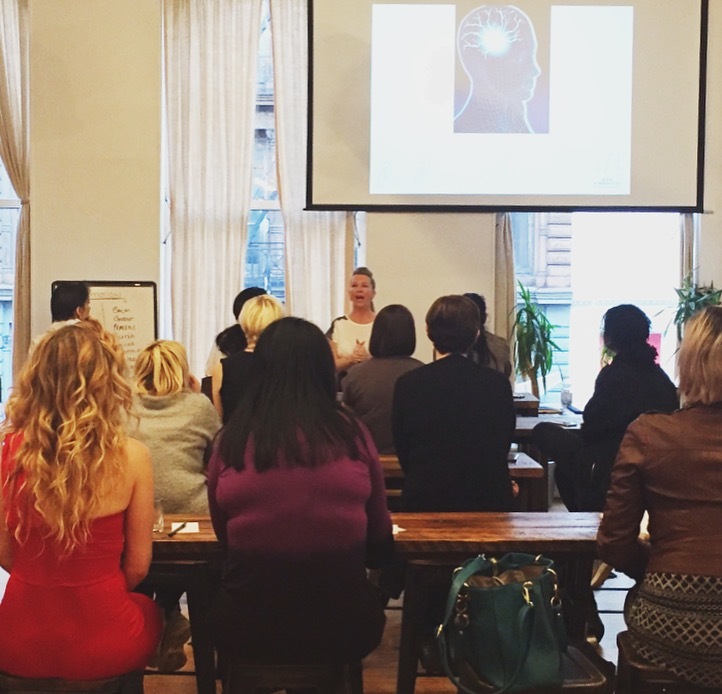 I attended a very informative event this week “The Warrior Mindset” with Counselor and Cognitive Behavioral Therapist Kelly Armatage, at The Farm Soho. This was hosted by Vitamin R, who hosts wellness events open to the public throughout the city. Vitamin R also brings innovative leadership experts to corporations to improve their culture and improve employee wellness. Not aware of their power, thoughts, emotions and habits. Spiritually unaware. Are responsible for their life experience. She taught us that we can learn how to think like a warrior because our thought patterns are learned and can be relearned. A neural pathway is a learned behavior. It is a highway in the brain that have been used so many times. People get a “high” when they carry out an act that is trained by their neural pathways. This could be a bad habit, like binge eating, or a good habit, like eating healthy. Our habits are trained on a neural pathway. Kelly went through two different mind exercises with two volunteers in the class. The first volunteer went through a Cognitive Rewiring Technique to help her have optimistic thoughts on about a job search that was stressing her out. The second volunteer also was seeking a new job and went through a technique created by Kelly called the A.S.K Technique. This technique can be found on her website here. Heal the past with acceptance. Acceptance of the past creates acceptance of yourself today. Forgive yourself and your past. Do not judge yourself or your past. Everyone is doing the best they can. You have the choice to either teach people how to treat you OR you can get distance from them. When you remove resentful energy toward people, people will THEN change around us. Manifest from the heart, not the mind. Once your heart opens, you will start to have things happen that you want to happen. After the class, I had a feeling of empowerment and felt a sense of control over my life.